I got another box of awesome from Meredith this past weekend. I don't remember, anymore, how I came to call her my "minion". It's been a running joke for a long time. There is an animated movie out now, "Despicable Me 2", the sequel to the original "Despicable Me". After sending Meredith the bowl and the Skittles, she kept apologizing for not sending me something in return. She never has to do that. Friends don't keep a tally of who sent who what and when, but she loves to send me stuff. Now, I hadn't seen the original movie, so in this box is a DVD of that movie. I will watch it this weekend. Then I'm told I have to go see the second one in the theater, that it's better than the first one. 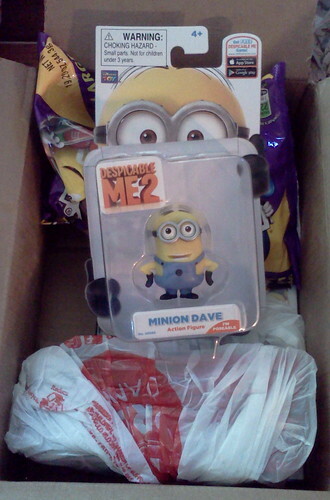 Minion Dave was something she saw in the store and decided I needed to have. I think he'd look really cute here on my office desk which means taking him out of the package. I have to get over myself that these things will be worth any money in the future, considering a million billion of them get produced as a movie tie-in. Another reason I have to see the movie is this clip Meredith posted to my Facebook account. I just giggle every time I watch it. "Barbara Ann" by the Beach Boys will never be the same for me. The best line is the minion singing "potato" at the top of his lungs. As usual with a box of awesome, there is chocolate. This box contains a bag of dark chocolate peanut M&Ms. I was really good about not eating the whole bag in a sitting. I divided it in half and then limited myself to half of one color. It helps that I like to dissolve the chocolate off the peanut and then eat the peanut. Taking time to eat an M&M that way means I eat less of them which makes the bag last longer. I have never seen these in my area. 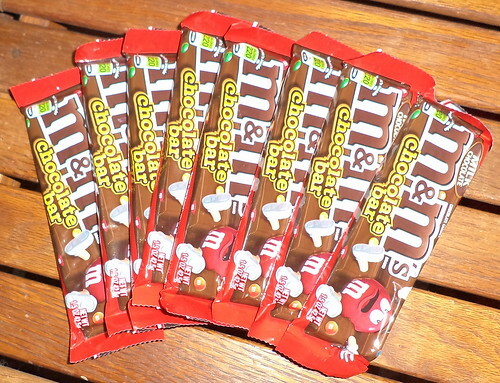 They are M&M's milk chocolate in a thin candy bar with bits of M&M's embedded in the bar. It's bits alright. The small amount of M&M bits almost seems like an afterthought. "Oh yeah, we make another candy. Let's see what pieces we have lying around that we can toss into the bar." These are very good. I've found that their richness causes me to eat just one a day and I only recently started on them since I had the bag of M&M's to consume first. I might buy these if they are on sale, but I think a Snickers or Milky Way would leave me feeling like I got more of my money's worth. I do think, however, that my weekend's entertainment will be a movie and a candy bar. Yes. That's a good way to spend a couple hours. Thanks Minion!